Being professional manga-ka is serious business. 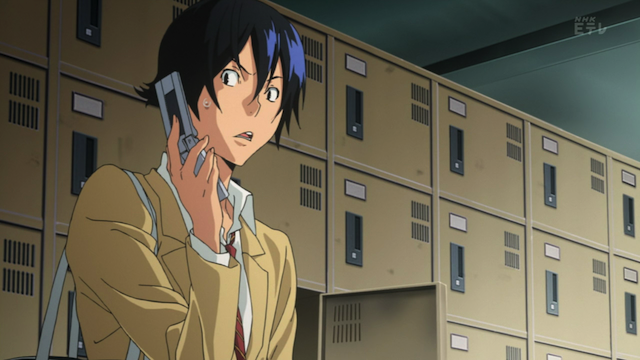 This is a first impression of season 2 of Bakuman. For an introduction to the series concept, see my first impression of the first season. I was somewhat negative in my final thoughts on the first season, so I wanted to give the new season a chance to make its case (and stand or fall on its own merits). To sum it up, the first three episodes of season two has focussed on the stronger aspects of the story, without completely overcoming the first season’s weaknesses. If you loved the first season, then season two is a great continuation. For those who felt disappointed that the first season dragged, and spent too much time on the romance between Mashiro and Azuki, the second season has, so far, avoided this particular pitfall. I still think the artwork is uneven and not up to the standards of J.C. Staff, but with this stronger storyline, perhaps the second season can finally deliver. Unfortunately the scenes of art materials are few and far between. 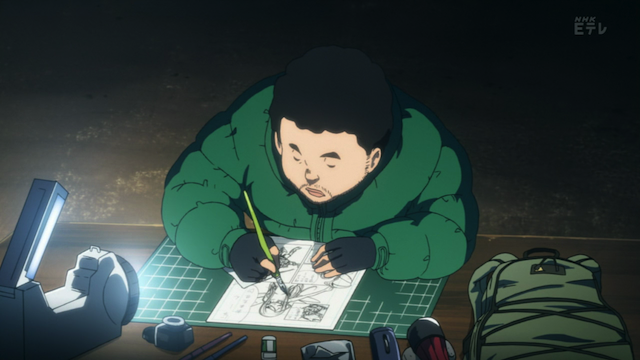 In all honesty, I would be happier with this show if they spent more time animating the process of drawing manga. These were some of my favorite parts of season 1. The author of Bakuman, Tsugumi Ohba, takes a more expansive view of the process of manga, including generating ideas, working with editors, managing a support staff, and so on. I do respect that, but the result seems to be lots of meetings … people talking to each other, which, in turn makes the artwork fairly static. This might be alright, except the character designs are not very impressive, and most environments are very bare and uninteresting (the notable exception being Ashirogi Muto’s studio). This is NOT a series that carries itself on the beautiful art and animation. Episode 1 includes the transfer to a new editor, which was well handled. getting used to their new position as published manga-ka, and learning how to work with the new editor, and the new assistants that are hired becomes a major focus of the first two episodes. This was legitimate material, although not particularly compelling. It had the advantage of not having anything to do with AzukiXMashiro. Azuki. Here we go again. Mashiro is worried about Azuki. 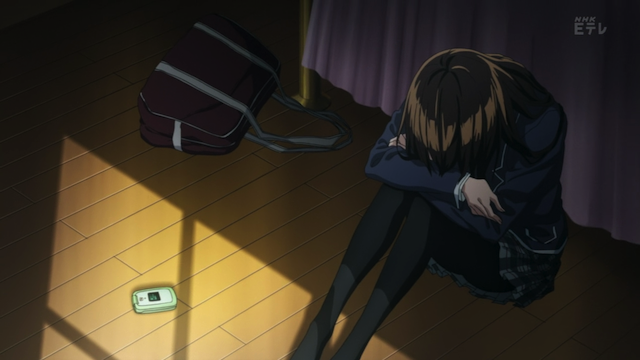 After an entire episode with close to nothing about Azuki & Mashiro’s pathetic relationship, the second episode was derailed by Azuki refusing to answer her phone. Everything ground to a halt as Mashiro tried to get in touch with her. The best thing I can say about this is that it got resolved within the episode, and the third episode had no sign of this nonsense. Takuro Nakai works by flashlight, through the night, outside in the cold of Winter. Yes, Manga is serious business indeed. The best thing I can say for the three episodes of season two included in this taste test is that the final episode of the three was the best. 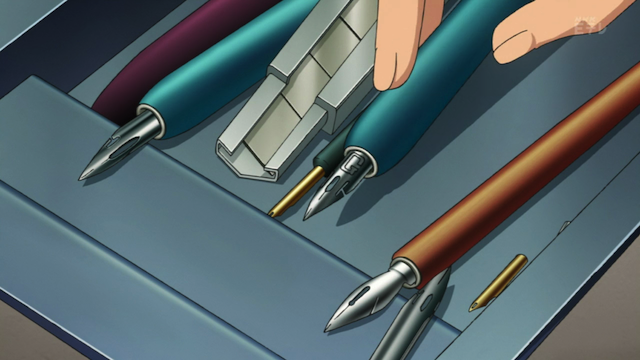 I really think it was a good attempt to capture the spirit behind the concept of Bakuman. Nakai is willing to put it all on the line for his art. 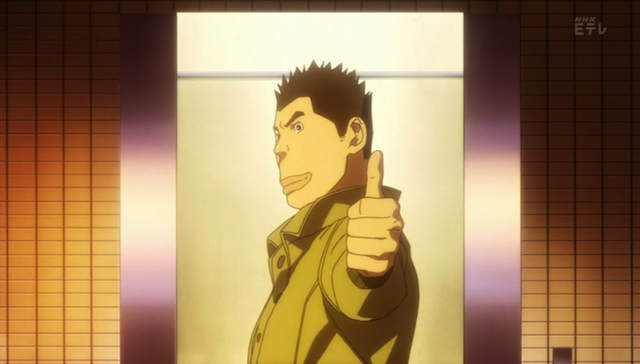 Mashiro’s uncle, we learned in season one, overworked himself to death, because he took manga that seriously. This is the shounen fighting spirit that I expected to see all along, and that peaked through the dark clouds of AzukiXMashiro in season one. 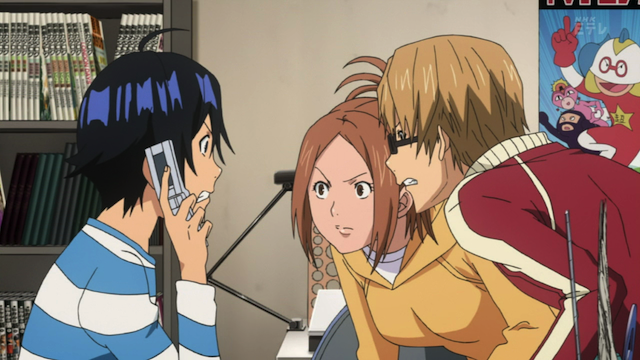 I will certainly continue to watch Bakuman. I hope that it can continue from this high point (one of the better episodes of both seasons so far). Unfortunately I suspect the ongoing problems of weak visual style and the threat of AzukiXMashiro dragging everything to a halt again will prevent this series from ever being truly great. It certainly is an interesting concept, however, and the story seems to have finally gotten to the point when it can deal with that concept directly.